Bridal lace and wedding fabric second to none! So you’ve searched ‘wedding dresses nz’ and ‘wedding dresses auckland’, maybe you’ve visited some Auckland bridal shops but haven’t quite found the wedding dress of your dreams? Perhaps it’s time to consider having one made for you. And if you have always dreamed of a lace wedding dress, you’ve come to the right place. 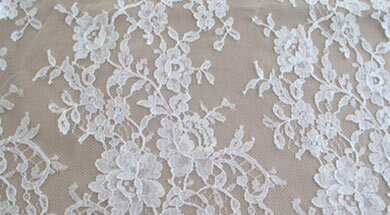 Our extensive range of lace fabric and other wedding fabric is second to none. Whilst we are not dressmakers, we can certainly recommend some fantastic bridal designers and dressmakers if you do not have your own. So sit back and peruse a selection from our exquisite range of bridal lace here on the website. Alternatively, pop in for an obligation-free chat and view the full range of our beautiful wedding lace in person. See testimonials from our delighted customers and allow us to help you create one of the most outstanding wedding dresses in New Zealand.